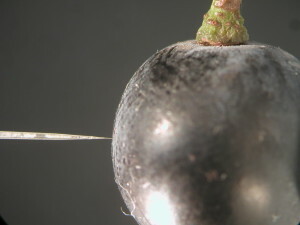 Miniature oxygen probe measuring oxygen in a Shiraz grape. University of Adelaide researchers have discovered how grapes “breathe”, and that shortage of oxygen leads to cell death in the grape. The discovery raises many questions about the potentially significant impacts on grape and wine quality and flavour and vine management, and may lead to new ways of selecting varieties for warming climates. “In 2008 we discovered the phenomenon of cell death in grapes, which can be implicated where there are problems with ripening, and we’ve since been trying to establish what causes cell death,” says Professor Steve Tyerman, Chair of Viticulture at the University of Adelaide’s Waite campus. Professor Tyerman and PhD student Zeyu Xiao from the University’s Australian Research Council (ARC) Training Centre for Innovative Wine Production have identified that during ripening, grapes suffer internal oxygen shortage. The research was in collaboration with Dr Victor Sadras, South Australian Research and Development Institute, and Dr Suzy Rogiers, NSW Department of Primary Industries, Wagga Wagga. Published in the Journal of Experimental Botany, the researchers describe how grape berries suffer internal oxygen shortage during ripening. With the use of a miniature oxygen measuring probe – the first time this has been done in grapes – they compared oxygen profiles across the flesh inside grapes of Chardonnay, Shiraz and Ruby Seedless table grape. They found that the oxygen shortage profile closely correlated with cell death within the grapes. Respiration measurements indicated that this would be made worse by high temperatures during ripening – expected to happen more frequently with global warming. “By manipulating oxygen supply we discovered that small pores on the surface of the berry stem were vital for oxygen supply, and if they were blocked this caused increased cell death within the berry of Chardonnay; essentially suffocating the berry. 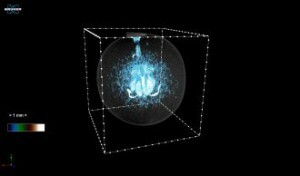 We also used micro X-ray computed tomography (CT) to show that air canals connect the inside of the berry with the small pores on the berry stem,” says Mr Xiao. X-ray micro computer tomography (CT) of the inside of a single grape berry showing the air spaces and air canals. The study was supported by the Australian Government through the Australian Research Council‘s Industrial Transformation Research Program (project IC1301100005) with support from Wine Australia and industry partners. This entry was posted in News and tagged Publication, School of Agriculture Food and Wine, University of Adelaide, Wine science. Bookmark the permalink.